Presenteeism remains a pervasive problem in UK office culture, as nearly half (47 per cent) of employees surveyed reveal they didn’t take a sick day in 2017 according to new research from Canada Life Group Insurance. While there has been a small decrease in the number of employees not taking a sick day from 2016 (54 per cent), the tendency to come into the workplace when suffering from a minor illness persists, as nine in ten (88 per cent) admit they go into the office. The reasons why employees were reluctant to stay at home when ill varied. Over half (53 per cent) stated that even though they were unwell they felt it did not warrant a day off. A quarter (25 per cent) said their workload was too great for them to take time off and one in ten (9 per cent) admitted they didn’t feel secure enough in their role to take a sick day. For those concerned about how their colleagues would perceive them, one in five (19 per cent) believe they would be viewed as weak, 17 per cent believe they would be perceived as lazy and 15 per cent believe they would be viewed as inconsiderate. However, positive perceptions were also popular with 17 per cent of workers believing they would be viewed as sensible or genuine and 15 per cent as honest. The majority of those who took time off for illness in 2017 were out of the office for between one and five days. Overall, the number who took this amount of time off remained fairly static, at 30 per cent in 2016 and 28 per cent in 2017. 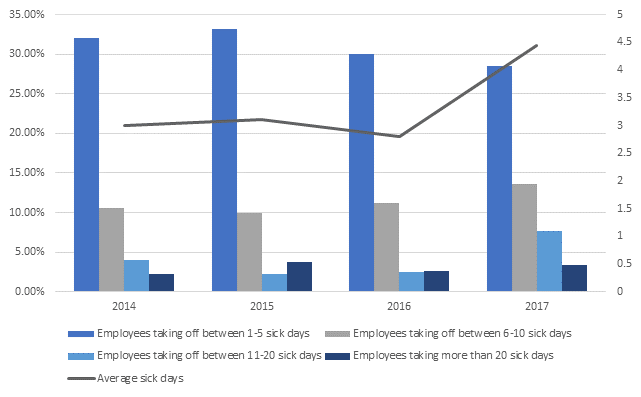 However, around one in twelve (8 per cent) took between 11 and 20 sick days in total – the highest proportion since 2015. Employees say their wellbeing would improve with flexible working, a positive attitude towards the issue and increased workplace support. Three in ten (28 per cent) say flexible working options would help with both their physical and mental health and this was particularly popular amongst women, with one third (33 per cent) agreeing. A similar number of workers (27 per cent) also said a more positive workplace attitude towards health and wellbeing would help, while a fifth (19 per cent) said better workplace support (for example, Employee Assistance Programmes) would be beneficial.